Unmanned vessels are giving designers plenty of scope to replace personnel quarters with technological clout. Rory Jackson reports, the latest wave of USV designs and updates are set to bring a range of unconventional hull architectures to the many marine markets that are growing in their awareness of the benefits that unmanned systems can bring. An exciting opportunity now exists for the unmanned community to cooperate and develop not only better and more robust unmanned systems, but fully autonomous systems that can work together toward a common task. Researchers are finding new ways to use and combine unmanned aircraft with autonomous surface and underwater marine vehicles to monitor coasts, protect fisheries and improve hurricane forecasts. Marine Advanced Robotics is set to deliver the next generation Multifunctional Assessment Reconnaissance Vessel II (MARV II) to the US Army’s Engineer Research and Development Center, Coastal and Hydraulics Laboratory, the company announced on 22 February. Marine Advanced Robotics, Inc. (MAR) has launched a new autonomous surface vessel (ASV), the 8’ Wave Adaptive Modular Vessel (WAM-V), offering new capabilities. The first 20’ WAM-V has been delivered to TeamTao, a finalist in the Shell Ocean Discovery XPrize competition. The new WAM-V has a range of over 400 nautical miles, can carry up to 600 lbs of payload, has a top speed of 15+ knots, and has passed rigorous open-ocean testing to ensure it is a stable platform for sensor deployment. Marine Advanced Research has announced that the first of the company’s new 20’ WAM-V USVs (unmanned surface vessels) has been delivered to TeamTao, a finalist in the Shell Ocean Discovery XPrize competition. The new WAM-V has a range of over 400 nautical miles, can carry up to 600 lbs of payload, has a top speed of 15+ knots, and has passed rigorous open-ocean testing to ensure it is a stable platform for sensor deployment. Richmond, California-based Marine Advanced Research, Inc. was present at this year’s Modern Day Marine(MDM) to introduce its WAM-V (Wave-Adaptive Modular-Vessel) family of autonomous surface vessels (ASV) to the Marines and others in the military expeditionary force. A global leader in the provision of Autonomous and Tethered surface and undersea vehicles, Teledyne Marine and their industry partners showcased an Autonomous, System of Systems approach to expeditionary Mine-Countermeasures (MCM) using multi domain unmanned assets. H-Scientific Ltd., a technology provider for the autonomous marine market, has announced that, working in conjunction with Marine Advanced Research Inc. (MAR). As part of the annual BlueTech Week in San Diego, attendees were given an opportunity to see several unmanned vehicle technologies in action. Unmanned maritime vehicles are being developed to keep humans safer in and out of the water. The International Trade Administration’s (ITA) Global Marine Technology Team has been working since 2010 to help grow U.S. exports of marine technology. The Maritime Alliance (TMA) recently returned from a successful 2-week U.S. BlueTech Trade Mission to Europe where 11 small-medium sized companies from 5 states participated in part or in whole in a 4-city tour. Just south of the Bay Bridge in the San Francisco Bay, dozens of container ships find anchorage while they wait their turn to be unloaded in the Port of Oakland. This is where Strategic Mobility 21 (SM 21), a San Diego based non-profit organization, hosted a Humanitarian Emergency Response Scenario at the Naval Post Graduate School (NPS) Joint Interoperability Field Experimentation (JIFX) 15-2. 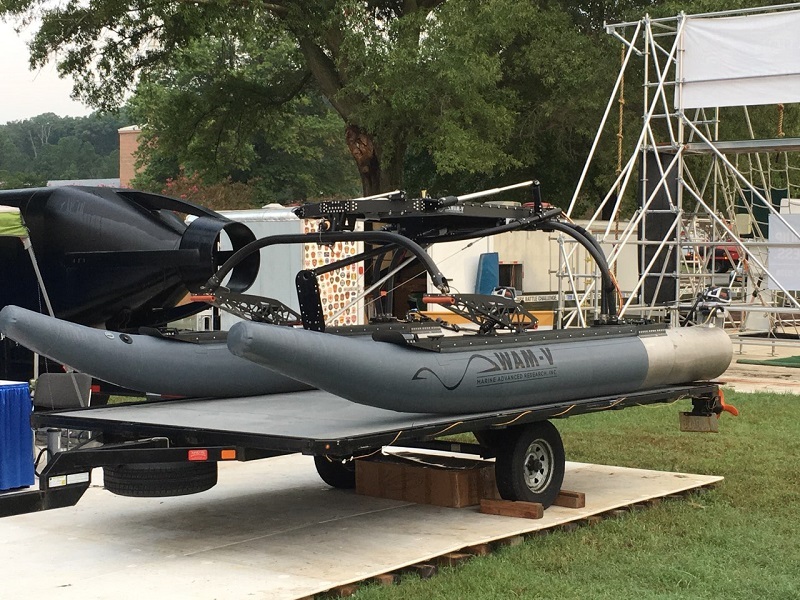 SM 21 partnered with Marine Advanced Research to bring new and emergent technologies together for a full-scale, joint-operation exercise employing an array of unmanned autonomous aerial and surface vehicles and sensors. Dr Larry Mallon, President SM 21, summarized participation in the quarterly event: “From all indications and direct feedback from Defense and Homeland Security observers, the event was a smashing success highlighting the role of autonomous vehicles such as WAM-V in protecting our ports and coastal cities and responding to both natural and man-made disasters”. Guest of honor Major General Ng Chee Khern welcomed dignitaries from South Korea, Australia, Japan and the United States at the launching ceremony for the inaugural Maritime RobotX Challenge. Afterwards, 15 student teams representing major universities in the United States, Singapore, Australia, Japan, and South Korea competed in Marina Bay Singapore for $100,000 in cash prizes. MIT-Olin took the first place finish followed by Korea Advanced Institute of Science & Technology (KAIST), Queensland University of Technology, Embry-Riddle Aeronautical University, National University of Singapore and Osaka University. Teams scored points by completing a series of tasks to demonstrate navigation and control; obstacle detection and avoidance; docking and target identification; underwater search for an acoustic source; observation, identification and reporting of a specified target. All 15 teams were outfitted with Wave Adaptive Modular Vessels (WAM-V®) for the competition. The WAM-V platform, designed and manufactured by Marine Advanced Research, Inc. in Richmond, CA, is an ultra capable inflatable catamaran. “The selection of the WAM-V as the sole platform for this robotic competition confirms once again how these vessels are perfectly suited for unmanned operations,” says Ugo Conti, CTO of the company. “The elevated, stable central platform of the WAM-V is ideal for housing the hardware and the sensors necessary to navigate autonomously.” For more information about the Maritime RobotX Challenge please visit the website at: www.robotx.org. Students from 15 major universities representing the United States, Singapore, Australia, Japan, and South Korea will compete October 20 - 26 in the AUVSI Foundation's Maritime RobotX Challenge in Singapore. The Office of Naval Research has equipped each team with an unpowered Wave Adapted Modular Vessel (WAM-V), along with grants to rig the vessels with customized battery-powered propulsion systems, sensors, computers, and software. The purpose of the challenge is to foster innovation as students develop their skills in autonomous command and control and systems engineering while collaborating with the engineers and organizations that develop the required sensors. Teams will battle for the $100,000 cash prize by completing a series of tasks to demonstrate navigation and control; obstacle detection and avoidance; docking and target identification; underwater search for an acoustic source; and observation, identification and reporting of a specified target. The 16’ WAM-V USV platform, designed and manufactured by Marine Advanced Research, Inc. in Richmond, CA, is extremely well suited for autonomous operations. “The lightweight and highly maneuverable WAM-V is the ideal platform for this competition,” says Mark Gundersen, President and CEO of the company. “The modular construction allows the WAM-Vs to be easily customized, transported, and assembled.” These flexible catamarans lend themselves to a variety of applications beyond the competition. WAM-Vs, from 12’ to 100’, can be employed internationally for ocean sensor deployment and retrieval; port surveillance and security; MPA monitoring and enforcement; UUV deployment and retrieval; nodal communications; maritime domain awareness; maritime interdiction operations; and offshore oil and gas operations. Most recently, Marine Advanced Research partnered with Google to map the first comprehensive coast-view experience of the San Francisco waterfront. To keep updated on the Maritime RobotX Challenge, visit: www.robotx.org.